This article was submitted by PHS Cutlass staff writer Nataly Panczyk. The Cutlass is the student newspaper of Palatine High School. To read more from the Cutlass click here. 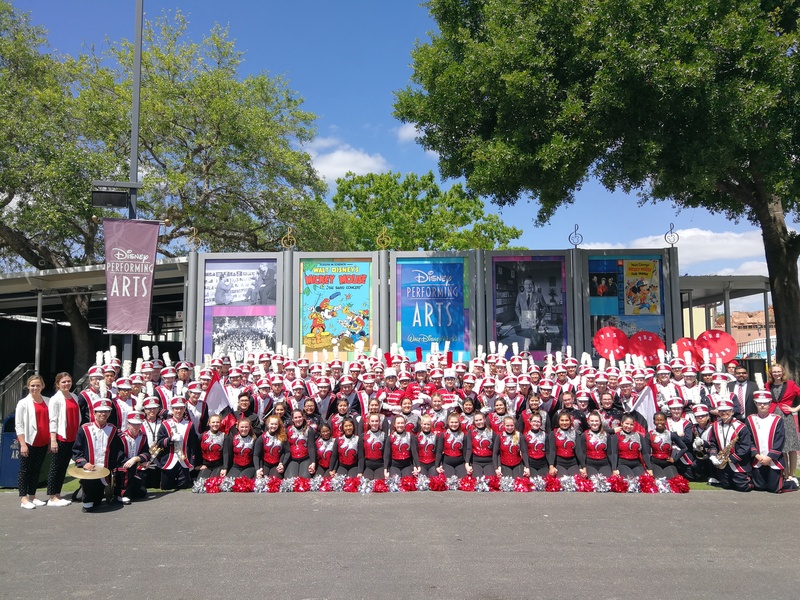 Each overflowing with excitement, more than 100 Palatine High School band, poms, and color guard members piled themselves onto three not-so-spacious coach buses fully geared with blankets, pillows, and lots of snacks for the 24-hour journey to their Spring Break destination— Orlando. The students, chaperones, and teachers officially started their trip on Sunday March 25 upon their arrival at Universal Studios. Earlier that day, the group stopped for breakfast after finally crossing the Florida-Georgia state line and awakening form their contorted bus slumbers. While it was officially prohibited to sleep on the floor of the bus, students made the best of their nighttime conditions by fully reclining seats, putting knees on the floor, laying stomach-down, curling into a human ball, extending their legs onto their neighbor, or for the lucky few— extending out onto the unoccupied seat beside them. And even despite these unideal conditions, by 9:00 a.m. the buses were packed with waffle-ridden, sunscreen-slathered, and Netflix-overdosed teenagers exalted to hit the theme park. “I think the Disney trip was very important because it let the freshman experience what it’s like to march without putting them through the whole program, and it lets them meet some of the seniors which they would have not met otherwise” senior Anna Froehling said. With industrial style efficiency, chaperones and teachers had students equipped with meal cards, park passes, water bottles, contact info, and arranged into orderly groups of four or more (per their own choosing) within 10 minutes of pulling into the Universal Studios parking lot. Then, it was off to the races. Students spent the entire day trekking between Universal’s two parks: Universal Studios and Islands of Adventure. Appropriately named, Islands of Adventure offers its visitors thrills of a lifetime on a variety of rides, ensuring that each individual finds multiple suitable to their comfort level. This includes traditional screech-inducing rollercoaster, The Incredible Hulk and the more technologically inspired Harry Potter and the Forbidden Journey, which features 3D displays and jaw-dropping simulation via a mechanical arm that truly makes you feel as though you’re flying through Hogwarts. Universal Studios offered similar experiences, with a slightly different themed venue. This included rides like Men in Black Alien Attack and the furiously fast Rip Ride Rockit, a tooth-chattering rollercoaster that allows riders to choose their own soundtrack to “scream to” during the ride. The group didn’t head to their hotel, the Rosen Plaza, until around 10:00 p.m., at which point students had the option to head straight for the Rosen’s outdoor pool, followed by showers and bedtime for the exhausted students. 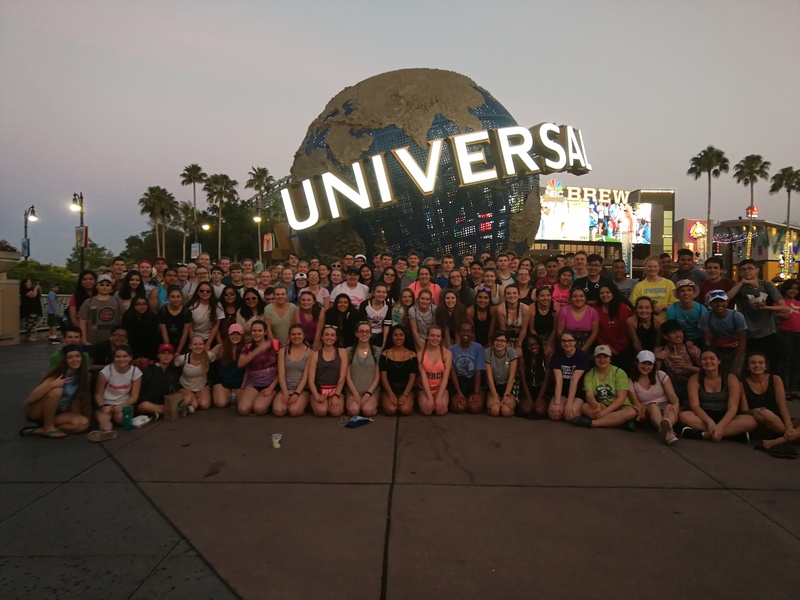 Rising bright and early the next day at the rings of their 6:15 a.m. wake-up calls, the students spent Monday enjoying themselves at Hollywood Studios, one of Disney World’s four theme parks. The features of this park include the Tower of Terror, a dropping elevator ride inspired by the Twilight Zone, and the Aerosmith tribute thrill ride, the Rock ‘n’ Roller Coaster. Most of the students also indulged in Mickey bars, a Disney classic ice cream treat made of a thick, chocolate coated, mouse-shaped vanilla ice cream pop, to combat the Florida heat which reached its peak mid-afternoon. The day also boasted three unique opportunities compared to the rest of the trip, including a Disney dance clinic, color guard clinic, and band workshop for the students to participate in. The students had the opportunity to enhance their performance skills and even learn a bit of new choreography/music at the instruction of a professional Disney performing arts person. 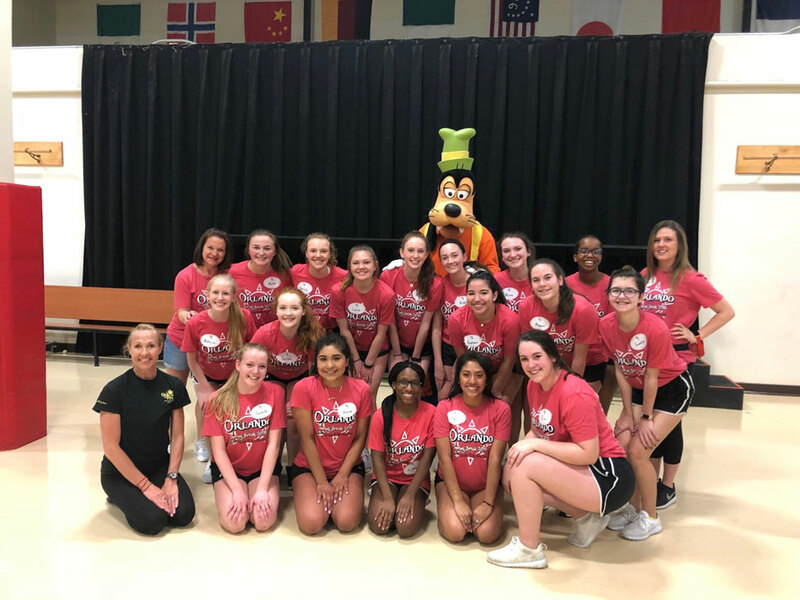 They were also greeted by a surprise visit from a Disney character at the finale of their clinics, catching most students completely off-guard in the best way possible. Tuesday marked quite possibly the most magical day for PHS students of their entire trip. The day embarked, per usual, with an early morning wake-up call and breakfast provided by the Rosen. Students then spent the morning dashing through the Magic Kingdom, sometimes waiting over two hours to experience rides like Space Mountain, Splash Mountain, or the Haunted Mansion— none of which, of course, led to even the slightest bit of disappointment. The smell of smoky roasting turkey legs, freshly buttered popcorn, and salty, soft Mickey Mouse shaped pretzels filled the air, as newly purchased sequined Minnie Mouse ears glittered in the scorching sunlight. Then, around noon at the peak of the day’s temperature index, the students gathered near Splash Mountain to head backstage and prepare for their parade. The PHS marching band would play, ever so appropriately, “Hot Hot Hot” and the colorguard and poms teams would perform enticing choreography to the melodious tune. Although they were practically melting in their uniforms, which were designed for autumn football games in Midwest, not 85 degree Florida heat, the experience was simply magical. 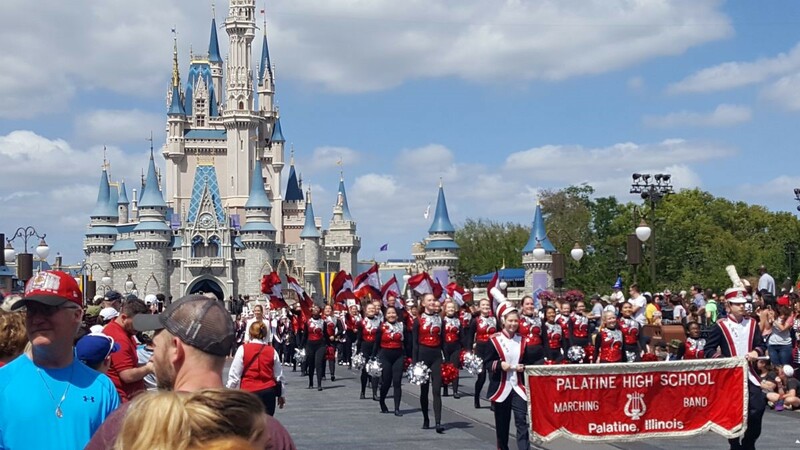 Not a smile was to be missed as the group paraded down Main St. USA to the iconic Cinderella’s Castle, and rightfully so as over 70,000 people attended the Magic Kingdom that day— Palatine’s largest audience by far. Their final day of the trip was spent at Epcot, an internationally themed park which featured the best food of the entire destination and meticulously designed gardens. This ranked very highly amongst the parks visited according to the students. While the rides in this park are limited, with the exception of Soarin’ and Test Track, both of which are incredible, the cultural representation more than made up for it. Cuisines from France, Italy, Norway, Morocco, and many others were enjoyed by the group as a refreshing upgrade from typical amusement park snacks. The trip concluded with a firework and water show inspired by Disney and nature over the lagoon of Epcot, and promptly thereafter the buses departed for Chicago. The trip was truly a once-in-a-lifetime opportunity, and a grand finale for the 2017-2018 season. Most students slept a large portion of the bus ride home, exhausted from the nonstop nature of the trip, but they will forever cherish their experiences on this unforgettable journey.